Produces up to 12 gallons daily; accommodating 25 to 40 users. Produces up to 7 gallons daily; accommodating 10 to 20 users. 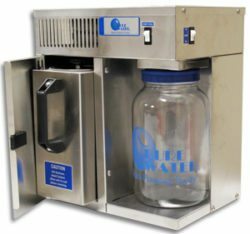 With the capacity to make one gallon of distilled water every three and one-half hours, the Midi-Classic is the ideal unit for a family or business. 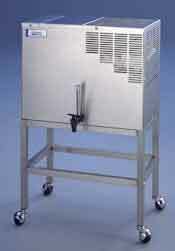 This automatic distiller holds approximately five gallons of pure water in its stainless steel holding tank. The Midi-Classic is constructed of top-quality stainless steel to provide years of dependable service with minimum care. 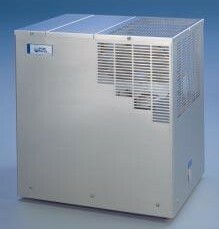 It is fan cooled and equipped with a unique float design to stop automatically when the storage tank is full. 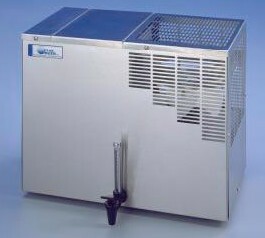 The Pure Water™ Midi-Classic may upgraded to accommodate a Custom Steam Distilled Drinking Water Distribution Network. Produces up to 12 gallons daily; accommodating 30 to 45 users. 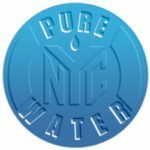 The ultimate in convenience and faster production, the Pure Water™ Mega-Classic produces twelve gallons of distilled water per day and is equipped with a ten gallon storage tank. It has a built-in demand pump to deliver pure water right to your sink and refrigerator or has a manual distilled water outlet for dispensing water directly from the storage tank. 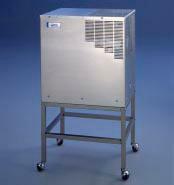 The Pure Water™ Mega-Classic can accommodate a Custom Steam Distilled Drinking Water Distribution Network. FIVE Advantages of Steam Distillation. 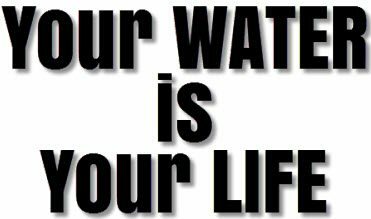 | for up to 60 gallons daily.